All you CyanogenMod fans out there are getting a sneak peek at the above image posted by none other than Steve Kondik himself. It appears, for all you rooting and ROM fans out there, that the CM10 team is working hard at pushing out Android 4.2.1 to the Galaxy S III, unofficially that is. Kondik says the software is “super smooth” and while it’s a minor update in terms of features, it does fix that silly “December” bug. “Just a few more days of work left and I expect we’ll have nightlies going for all the D2s. 4.2 is super smooth.” Says Kondik. I can only hope that the CM10 brings this to the Note II and other devices next, but in the meantime it’s just another piece of good news for all you rooting fans out there. Can’t wait for this to hit GN2 soon. As nice as TW has become, I still prefer to work with the AOSP as a base and customize from there. Good stuff. Truthfully, I find the Nexus’ all have one thing I hate: no SD card expansion, on top of the fact they come with no more than 16GB onboard. I don’t buy the explanation that Google put forth either. Don’t take away options. Build around the options I say. noob question but do you have to factory reset every time you update via nightly? Hows your wifi calling, face unlock, eyeball detection, face orientation detection, device encryption, allshare cast, kies? Does CM 10 support all this? I’m also rooted and with Frosty v11 but I am curious with CM10 pure google if they also support the things I use everyday especially wifi calling, eyeball detection and face unlock… and face orientation detection is also very useful. wifi calling isnt really necessary if you live in an area that has been refarmed. you get the signal you want. unless your travelling internationally, its not really a big deal. face orientation isnt a necessity. face unlock is a part of aosp android. eyeball detection isnt necessary either. push power button and it turns off. the pure speed and lightness of cm10 makes not having wifi calling worth it. if they did put wifi calling into it, it would be perfect. Sorry but if there’s no WiFi calling I would get out of Tmobile. I work to a place (underground) where there is no signal, but thanks to WiFi calling, my phone still works. So for me it is a priority and it is a must. Also, face orientation is important. Sometimes I read while lying down and if you lie down side ways the phone rotates yet your face is not. I got used to face unlock, I’m not sure I will enjoy a phone without it. Eyeball detection is what all phone should have, try reading a long blog then your phone just dim and turn off its backlight.. Very annoying. For speed.. LOL.. Do you think those features slows down the GS3 for 5 or 10 seconds? Theoretically it should be slower but for what? We are speaking microseconds difference here. So far, speed isn’t not an issue for me anymore, these phones are just too powerful. 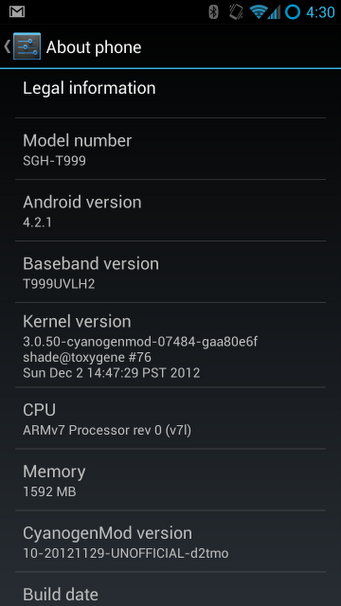 I am a CM user since CM4.x (G1 time).. but if they don’t include the features I need I am staying with Frosty v11 ROM. Also, I have never seen CM put an OTA update.. I don’t know now but Frosty ROM has OTA updates and getting Android 4.2 update is just an OTA away. That’s why there are multiple developers :-). Cm10+ does have an ota updater built in. I will admit that I don’t use my phone to read long blogs. Aosp is that Mich more fluid. I couldn’t believe it as a couple days ago I went back to stock ICS. What a difference.flashed stock JB and ICS was faster with the addition of bloat. Removing it helps a lot, however I personally would lose some features to have the fluidity of aosp. I was always the first to root and flash CyanogenMod but on the SGS3 there are so many slick features that you will not have if you go the CyanogenMod route. On the SGS3, I left mine completely stock, can’t believe I just said that but yep I am so happy with this phone, fast as hell, smooth as glass. After we received the Jelly Bean update this phone is just perfect. I have the white phone with 32 gb of int storage. I just couldn’t be happier. Saying that I just ordered the Note 2 in white. Just wish the Note also came with 32 gb of int storage. But I’m sure I will be happy. Going to use my SGS3 as my daily phone but just had to have the Note 2 because I like new phones. Will never sell my SGS3, to me it is the perfect phone. My phone is rooted with stock and the speed is fine with JB, the only thing I would like is the ability to store apps on my 64GB sd card and free wifi tether. Does it fix those too ?